Well let me tell you about a spirit of bravery that has touched so many lives, mine included. Terry Lewers, better known to everyone as “Tutz” came into our church one day a few years ago and thankfully, never left. Little did anyone know the impact that this woman would have on the church and the community. Tutz rapidly became a trusted friend. She is one of the most kind people I know and she will not hesitate to tell you what she thinks. That is a great attribute for any friend, especially to a pastor who is trying to do the right thing when conducting church business, planning services and other duties. Terry is a fantastic “sounding board.” When you ask for her opinion don’t expect the watered down version. I hope she knows how much that means to me. We were searching for a song leader. Terry hesitated but accepted the challenge. She does such a good job with the song service and one of my favorites, she would oft times read a short narrative of the origin of the song. When Terry and Stack came to Lighthouse she was a cancer survivor. I wouldn’t have known that if one of her family members had not told me. It’s never been about her. Her goal in life is putting others first. She is always there for others. I guess it comes from her career in nursing. I’ve seen Terry go to friends houses who had loved ones who were seriously ill. She would not even consider taking any payment for coming out at all hours of the night to take the vital signs or whatever the patient or family needed…she would take care of it. Her caring spirit did not stop there. She is always looking for ways to do more for her family, her friends, her church and her church family. 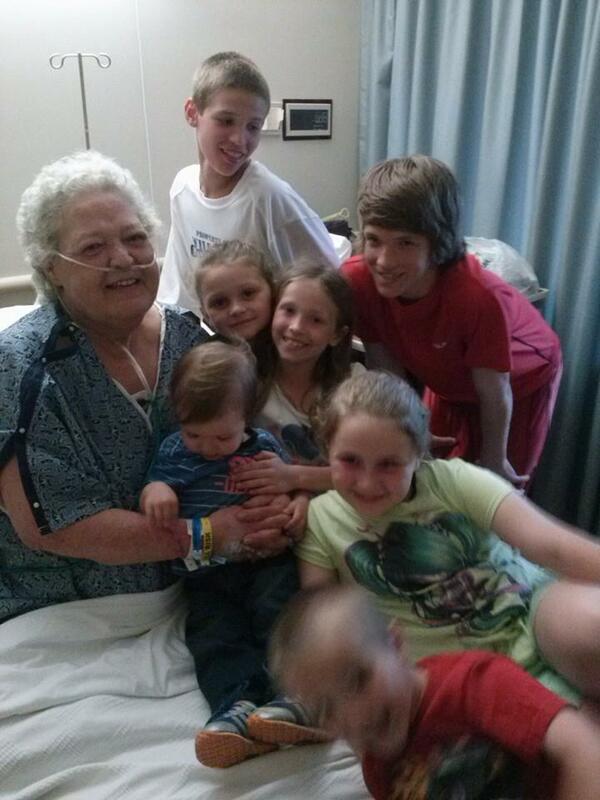 Tutz’s children and grandchildren are her life. Many times she has brought some, if not, all her grandbabies to church. Even now, when Stacey brings her children to church at least one of them is going to sit with their Tutz. It is obvious that she has those children’s love and respect. Life doesn’t always go just as we wish. At least, not on this old earth. A couple of years ago, Terry found out her cancer had returned. The treatments began immediately but she didn’t miss a Sunday of leading the song service. Now she did go from having long hair one week to having none the next week, but it didn’t bother her one bit. My guess is when the hair started to fall out she removed the rest of it. If it was going to come out, it was going to be on her terms. Many folks would have just shut themselves away from the world, but that just isn’t Terry’s style. She has been in and out of the hospital many times over the last year. Been a time or two that quite frankly, I never thought she would come home. I guess I underestimated her resolve. She and Stack attend church each week. Many of those days she doesn’t feel good at all but she enjoys worshiping her Lord with her family. 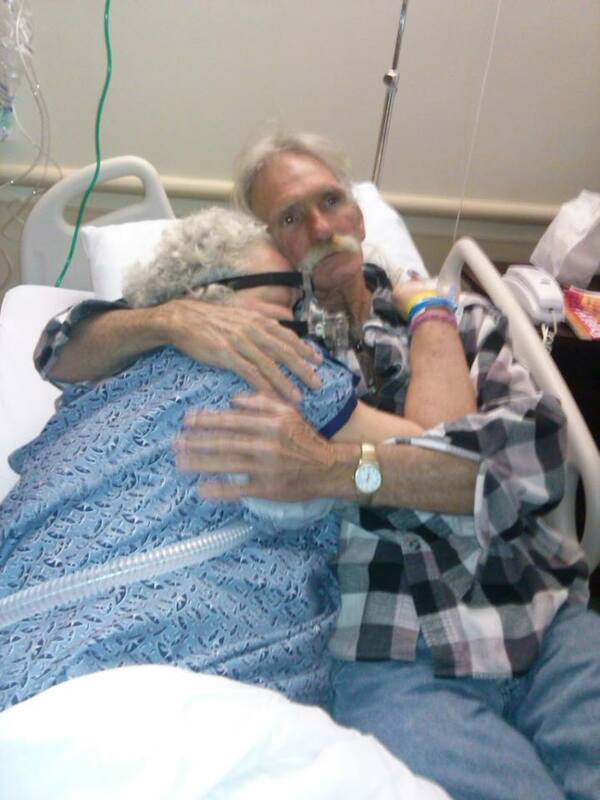 Stacey took this picture during Terry’s last hospital stay. I may get whipped for posting it. They say a picture is worth a thousand words. Well this one is worth Ten Thousand Words. We have no guarantees for tomorrow. None of us do. 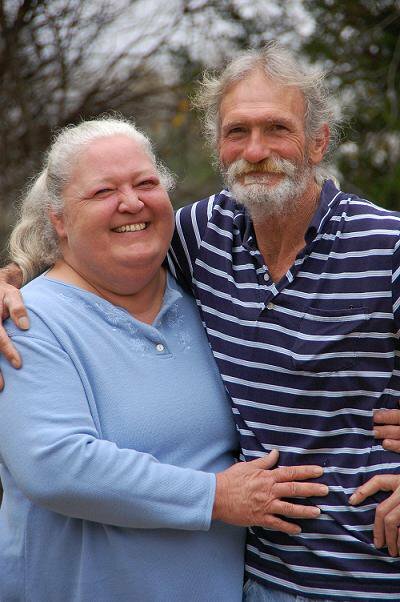 Terry understands, as does her family and friends, that barring a miracle she will be going to her eternal home before too long. Yet, the smile is always there, she continues to worry more about others than she does herself and has faced this chapter in her life with more faith, grit and determination than is humanly possible. Her faith has never wavered. Not once has she asked, “Why me?” Again, that is just not in her nature. Far too many times we wait until it is too late to tell someone how much they mean to us. Well, Tutz, you mean a WHOLE lot to me. Just wanted you to know! Many of Terry’s family and friends are wearing these shirts in support of her fight against cancer. The proceeds will help defray her medical expenses. If you are interested in joining the fight the shirts are $20. Contact me @ byron@lbcalba.com for further information. All I can say is…wow. Couldn’t be more spot on and you rocked it, Byron! Our family loves you so very much and you are just as much our family as blood. Thank you and her church family for the CONSTANT love and support! Very good Byron and right on!! Prayers for you Tutz & Stack and rest of the family..
Prayers sent to you Tutz and Stack! Y’all are great people. You did good Byron! Tutz and I have talked at length about what our future holds. She has taken hours to explain her journey to her grandchildren. She can explain it in a manner that her youngest can understand and they all know she will be happy and healthy when HE calls her home. Good job Byron. 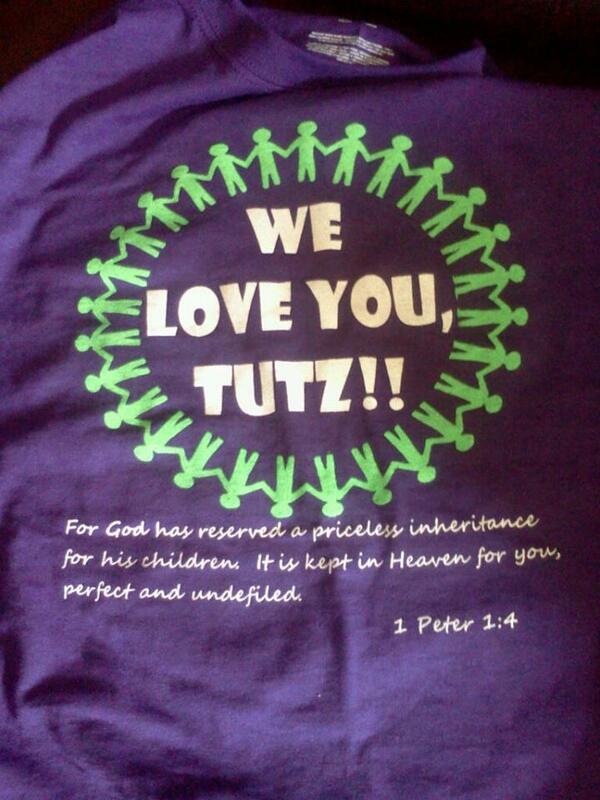 Love love Stack and Terri, they have both been a blessing to my family, praying for you Tutz. Terry and her smile will be missed severely. Stack, Stacey and the rest of the family will be in our prayers. RIP Terry!! God gained an angel and it was my pleasure to have known you. I am so sorry for the loss of such a wonderful, Christian lady, but glad she is pain free and happy with our Lord. I will never forget the kind and sweet expression on her face when she gave me a big hug a few days ago.